I need to let you all in a little secret. Ok, it isn’t exactly a secret but I am so obsessed I feel like I’m holding on to a treasure and have to shout it from the rooftops. If you’ve been in Dallas for some time you have undoubtedly been to or at least walked past State & Allen Kitchen + Bar on the corner of, well, State and Allen. The nice folks over there invited me in to check out their scratch kitchen menu for lunch the other day and y’all know me – I’m going to serve it to you straight. With that said, it was freaking AWESOME! I kicked off the afternoon on their sprawling patio that hugs both street corners with “The Allen” made of Bombay Sapphire Gin, Grapefruit Juice, Lemon Juice & a splash of Licor 43 as well as (don’t judge me) “The Eleanor” which has Western Sons Grapefruit Vodka and Prosecco. 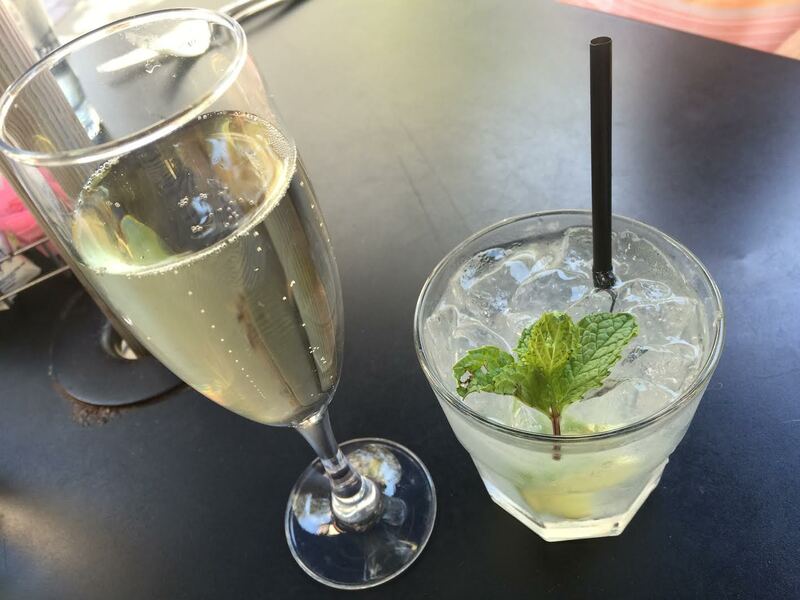 Both were absolutely perfect for a warm summer afternoon…or any afternoon, let’s be honest. Here at State & Allen Kitchen + Bar, they really pride themselves on their cocktail program. The drink menu is impressive and broken into several different sections, including S&A cocktails (where The Allen and The Eleanor live), Our Texas Pride, Grey Goose Mixology, Scotch and of course, your standard wine and beer lists, too. The next time you are in the market for a damn good cocktail, be sure to remember State & Allen. 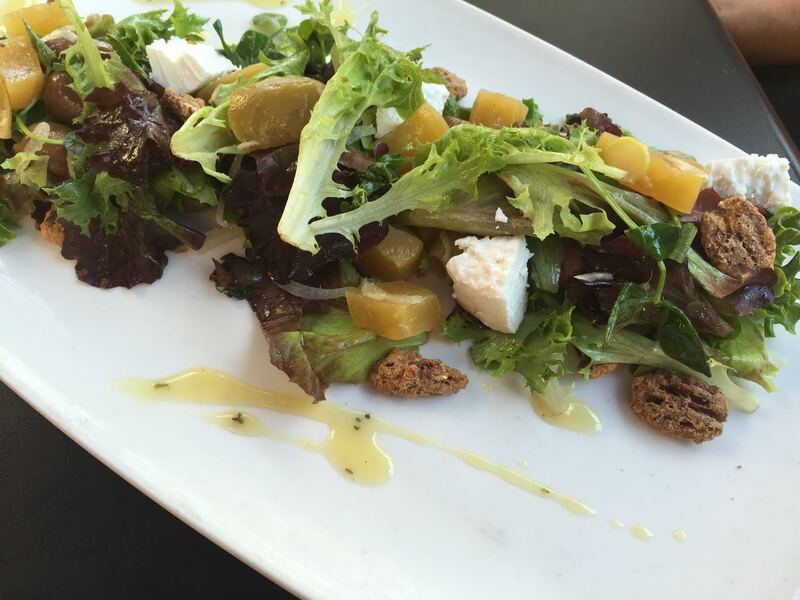 Beets & Pecan Salad ($10). With Watercress and shaved fennel as the base, beautifully spiced pecans, tender beets, olives and goat feta are tossed in just the right amount of white balsamic vinaigrette. This is the perfect salad for lunch on a warm day and will make you want to lick the plate clean. S&A Chicken Strips ($9, $11 with fries). Crispy marinated chicken strips rolled in 9 herbs and spices and served with your choice of dipping sauce. Just whoa. My picture doesn’t remotely do these delicious strips justice. They were tender and juicy with a fabulous crispy crust surrounding them but magically without an ounce of grease. 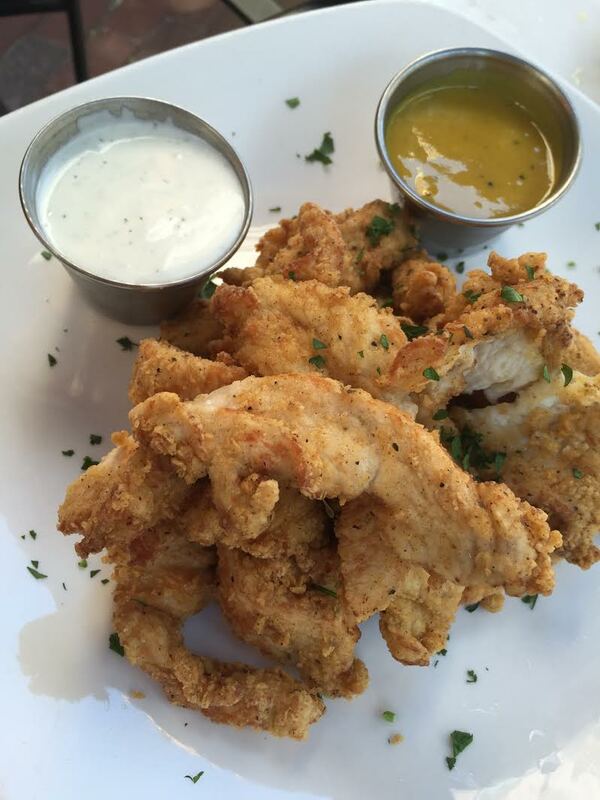 They’re like skinny chicken strips…which is a thing..I just made it up! Adding fries to this appetizer would make it more than enough to be called a full meal. 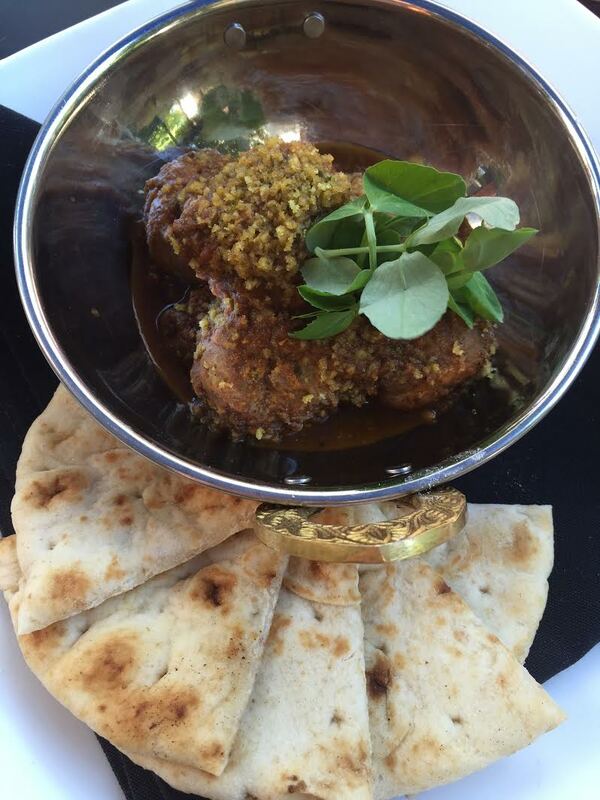 Curried Lamb Balls ($11). These lamb meatballs with Gremolata and charred tomato sauce have just the right amount of curried kick, allowing for a bit of spice but a lot of flavor. They are a great app to share with 3-4 meatballs per order and are served with fresh toasted pita to help sop up the sauce at the bottom of the bowl. Silver Bowl aka “The Original” ($12). Chopped romaine, bacon bits, grapes, oranges slices, red bell peppers, spicy chicken and two dressings – balsamic vinaigrette & caesar make up this shockingly fantastic salad. It doesn’t sound like anything crazy exciting but I have to say that this is probably one of the best salads I’ve had in my life. The spicy chicken is more like teriyaki chicken and the pop from the fruit balance it out perfectly. 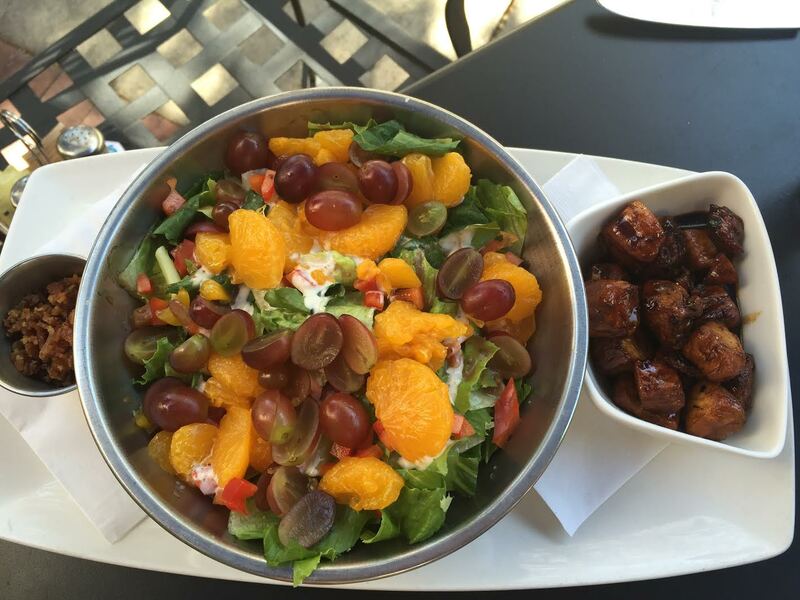 I can’t even tell you how much I’ve fantasized and craved this salad since my visit. The Silver Bowl is huge making it an absolute steal for $12. Summer Sandwich ($10.50). Rustic Italian bread smothered with sun-dried tomato aioli hold together sliced green tomato, fresh mozzarella, charred radicchio, squash blossom and Shiso cress salad. A surprisingly light dish that will change any non-veggie lovers mind right around. 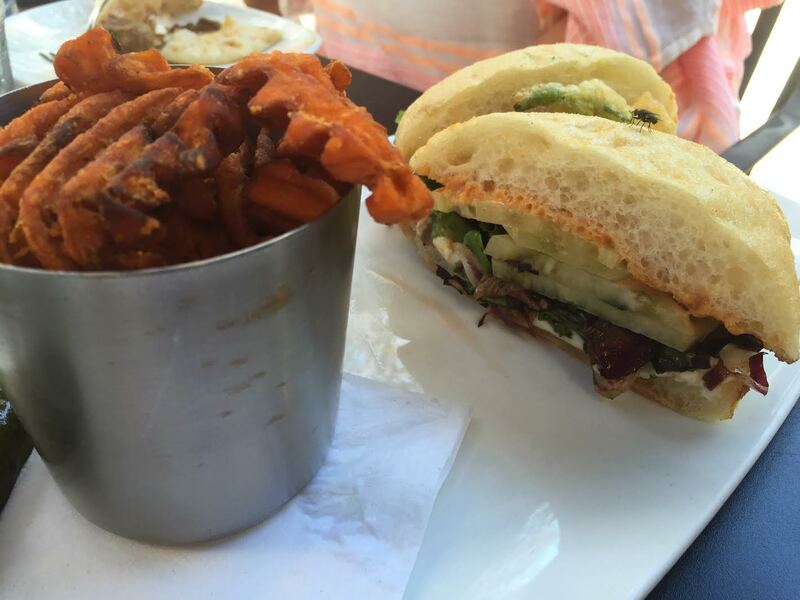 The sandwich is also served with your choice of fries…HELLO sweet potato waffle fries! I don’t know anywhere else in town that serves them, so be sure to grab a side – they rock! 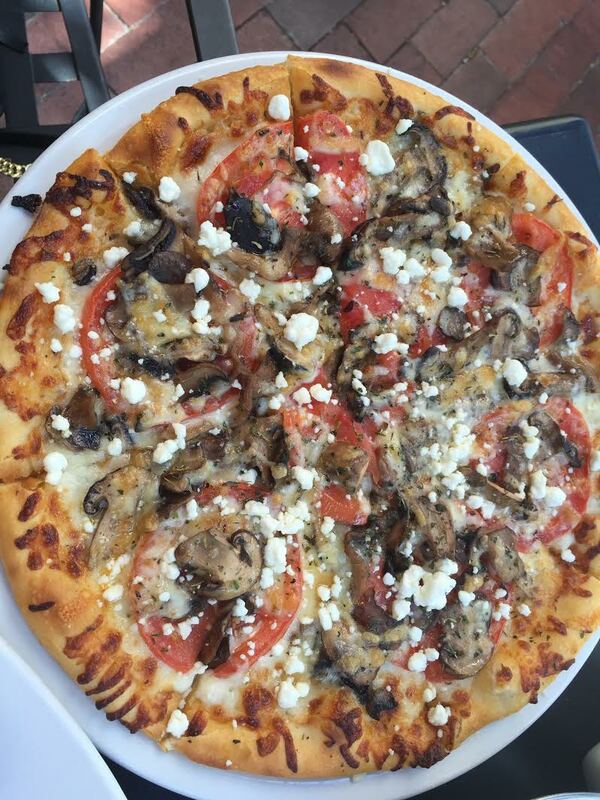 Wild Mushroom Pizza ($12.95). Sliced mushrooms, gouda, goat cheese and fresh tomato slices are topped with garlic oil to make this pizza an absolute flavor explosion. The crust is surprisingly thick but manageable, allowing itself to be the perfect vehicle for the loads of toppings. The rich cheeses make this pizza are an interesting combination and while you may feel guilty eating it, it is definitely worth a few extra reps at the gym! Flourless Chocolate Cake ($6). 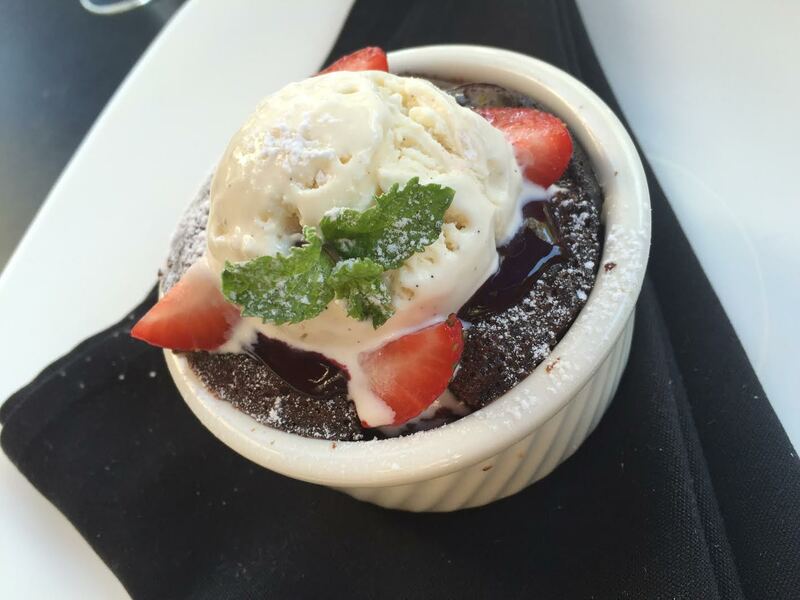 A warm, rich chocolate cake baked into a ramekin then topped with vanilla bean ice cream, a berry compote and fresh sliced berries for just $6? How could you go wrong? No meal would be complete without dessert and this dish was a true winner. I’m generally not a huge chocolate cake fan but the berry compote/sauce on-top added just the perfect amount of tartness to balance off the sweet, making me wish I could bring another one home to eat as a late night snack. So, ok. I realize that I ate a lot of different things but you know I wouldn’t steer you all wrong. Truly every dish that I sampled was exceptional on its own and I would have been satisfied with any one of them alone. Sure, I was stuffed to the brim as I walked back to my car parked in the free lot behind the restaurant (thank god you don’t have to try to battle for street parking when dining here!) but couldn’t help but wonder when my next visit to State & Allen could be. There are so many more incredible sounding items on the menu that I want to try and based on the straight A report card this meal received, I can only imagine that the other dishes are just as great. Ready for a fun fact? 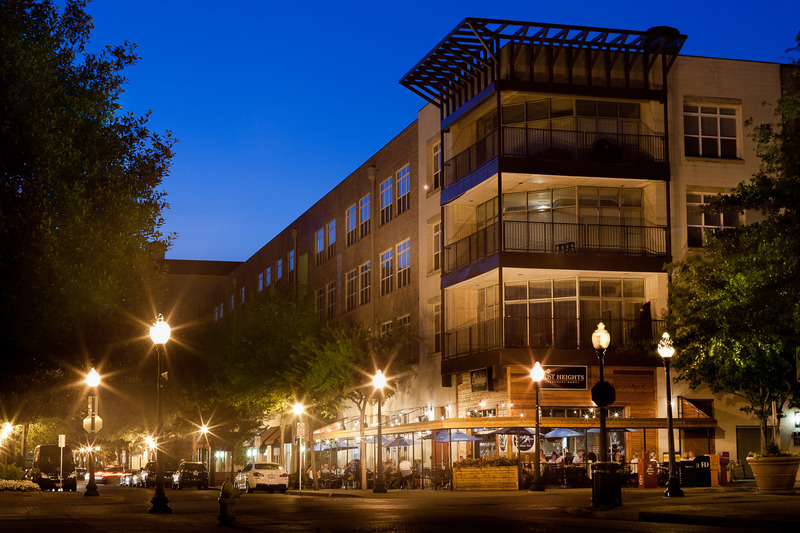 State & Allen is one of two certified “green restaurants” in Dallas. That means, water is poured only on request, compostable take out containers and much more. As a bonus, if you bring your own coffee cup to Sunday brunch, you’ll get your coffee for free! I absolutely love the fact that S&A is doing their part to make our world a better, satisfied tummy society. With a killer patio, great service and food that will leave you begging for more, take it from me and go check out State & Allen Kitchen + Bar immediately. Pro tip: over order so you get another meal out of it. TRUST. You are going to want to take my advice on this one, folks…enjoy!